Today I am participating in my first Blog Carnival (or blogero, click here for the Spanish edition), which is called #SnakesAtYourService and is about the roles snakes play in ecosystems. Check out the links to the other posts below. I've already written a series of posts about identifying snake sheds, which is definitely the most common question people ask about them (those three posts make up over a third of all the traffic on this site). People ask other questions about snake sheds much more rarely. In fact, I never stopped to ask some basic questions myself. What are snake sheds made of? What are they used for, and by whom? Where are they found? Do they make substantial contributions to ecology? You might think that because snake sheds are so insubstantial that they don't have much of an impact, but several facts about snakes lead us to believe otherwise. Snakes can occur at high densities, although their population density can be difficult to measure because snakes are so hard to find. Some estimates provided by snake population ecologist JD Willson in his dissertation included 4-14 vipers per hectare in Scandinavia, 275 vipers per hectare on Shedao Island in China, and over 1000 ring-necked snakes per hectare in Kansas. Aquatic snakes in Ellenton Bay, South Carolina, where I did my undergraduate field research, can reach densities of 170 snakes/ha. I did a couple of back-of-the-envelope calculations using these estimates, plus those for snake shed frequency and shed energetic content, and found that all snakes shedding across the entire continental United States probably generate close to 1.6 billion pounds of shed skin each year, which contain about 3.6 trillion calories of energy. That's enough for everyone in Alabama to survive eating nothing but snake sheds every day all year long (ma, not this for dinner again! ), if they could somehow collect all the snake sheds from the entire country. So it isn't an unimaginably immense amount of energy, but it's not insubstantial either. Given the results of this rather bizarre thought exercise, I think it's safe to say that shed snake skin contributes substantially to nutrient cycling in areas where snakes frequently shed. What exactly do I mean by nutrient cycling? Think of it as nature's ultimate recycling. It's one example of the services that ecosystems provide for free, and it's why you have regular access to clean water to drink, air to breathe, food to eat, and other essentials, without having to manufacture or engineer systems to produce these things. The cycles of carbon, nitrogen, sulfur, and other elements in and out of the water, air, soil, and the bodies of plants, animals, and microbes, are critical to maintaining a healthy ecosystem. Perturbations can lead to serious imbalances, like the changes to the global carbon cycle that result from the burning of fossils fuels. Few people have investigated the roles that amphibians and reptiles play specifically in nutrient cycling, but we are beginning to suspect that they are important components of many ecosystems. They may be small, but there are a lot of them. 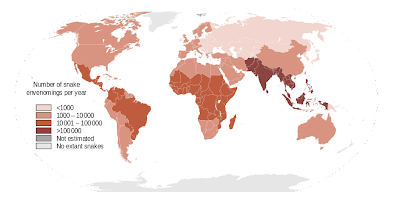 For instance, redback salamanders in forests in the northeastern US outnumber all other terrestrial vertebrates combined. 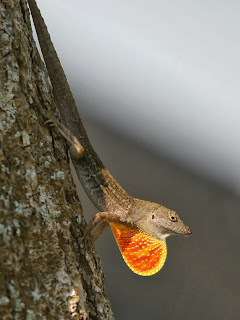 On some tropical islands, lizards occur at densities of over 67,000 per hectare. 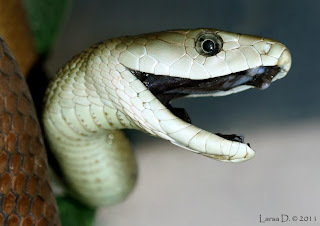 Snakes can occur at really high densities as well, partly because they are so efficient at converting food into biomass as a result of being ectothermic (cold-blooded) and partly because feeding as infrequently as they do reduces the effects of competition with other snakes. By one estimate, snakes are 25 times more efficient at turning food into biomass than carnivorous mammals of equal size, and occur at population densities 20 – 1400 times greater, meaning that they probably contribute disproportionately to nutrient cycling. Explicit investigation of this phenomenon is underway in turtles, which have large bony shells that probably contribute to cycling of calcium and phosphorus, but to my knowledge no one has so far studied this in any snake, let alone for shed snakeskin. In the wild, shed snake skins disintegrate in about a week, although if you collect one and put it in a plastic bag, they can last decades. The chemical composition of snake sheds is poorly known, but they contain some keratin and some lipids, among other things. Some fungi feed on keratin, including those that cause athlete's foot and ringworm as well as the chytrid fungus that has caused amphibian declines worldwide (with disastrous consequences for the snakes that specialize on them), but these species mostly grow on living organisms. Although we don't know for sure, it seems likely that numerous fungi and microbes have probably evolved to take advantage of the abundant energy found in snake sheds. Of course, the dead bodies of the snakes themselves also eventually contribute to nutrient cycling, but depending on the source of mortality, many of those are probably eaten by predators, and fewer probably decompose compared with snake sheds. 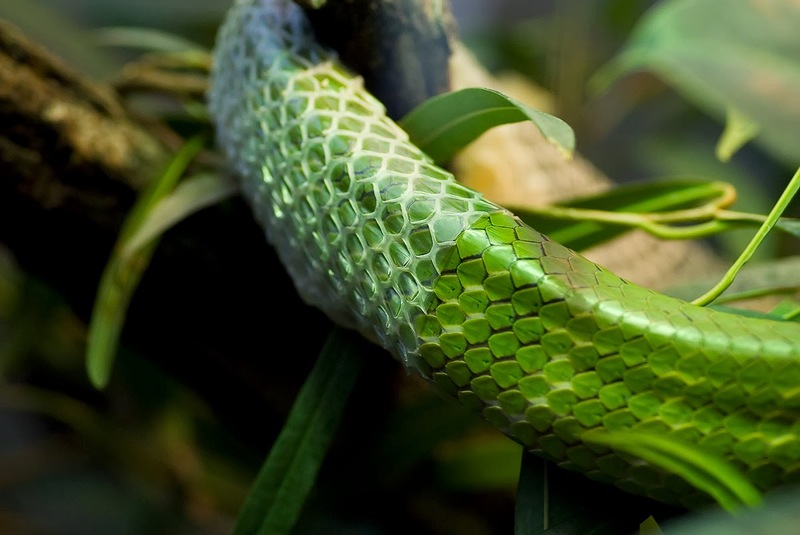 Snakes shed their skin in order to grow bigger. You do this too, just not all in one piece. Once a snake sheds its skin, it's typically done with it. However, both snakes and you might be surprised to learn that snake sheds are frequently used by other animals for a variety of purposes. As I mentioned previously in my article on conservation successes with Eastern Indigo Snakes, snake sheds are really smelly, and specially-trained dogs can sniff out even individual scales left over from a decomposing snake shed. 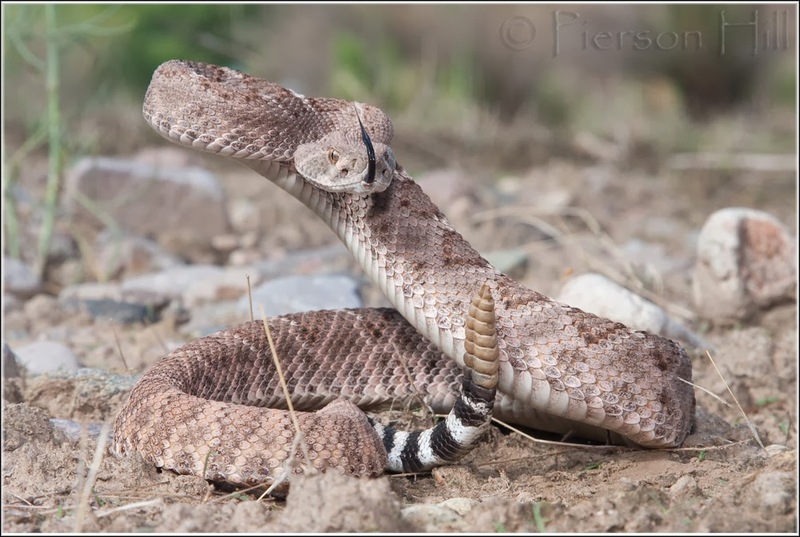 This might be one reason that, although snakes usually spend several days inactive at their shedding site prior to shedding, they don't normally hang around for long afterwards - their predators might have an easier time finding their stinky sloughs than they would finding the snakes themselves. This could be especially true when those predators are other snakes. Some evidence suggests that dogs have an easier time sniffing out snake skins than actual snakes - the indigo-snake -sniffing dogs correctly identified a concealed snake 4 out of 5 times, but they got the sheds right every time. Dogs have also been used to help search cargo on Guam for hitchhiking Brown Tree Snakes, an invasive species which has spread around the Pacific. No word on whether the Brown Tree Snakes were shedding or how this affected the dogs' ability to smell them. Most shedding sites are protected in some way, because snakes are vulnerable prior to shedding - they cannot see and other functions may be impeded as well. Shed sites used by Black Ratsnakes in Ontario include old barns, old mining machinery, cracks in building foundations, old hay piles, large hollow logs, rock crevices, and standing dead trees. Most of these things sound like something somebody might want to "clean up", but the fact is that they are important habitat features that many amphibians and reptiles use for shedding and also for hibernation. Many burrowing snakes come to the surface to shed, and shedding snakes may remain on the surface even during cold weather, when other snakes have retreated underground. Sometimes other animals exploit the stink of snake sheds. Ground squirrels in California use them to scent themselves - first they chew up shed rattlesnake skins, then vigorously lick their own fur, which results in a type of olfactory camouflage that reduces a rattlesnake's ability to correctly identify snake-scented ground squirrels as prey. Rattlesnakes and ground squirrels in California a partners in a coevolutionary relationship that goes back millions of years and has been well-studied by scientists from both the predator's and the prey's point-of-view. Birds use snake sheds in their nests, something people have noticed since at least as far back as the 1800s. Although birds cannot smell, ornithologists (who should study snakes more often) wondered whether the shed skins helped protect eggs or nestling birds by deterring would-be predators. Recently, two experiments have helped determine which predators might be frightened off and whether the strategy really works. 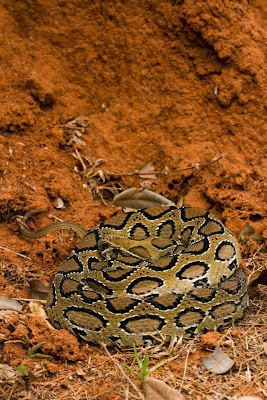 Ecologists at Arkansas State University conducted a study to test whether snake skin is an effective deterrent to predators. 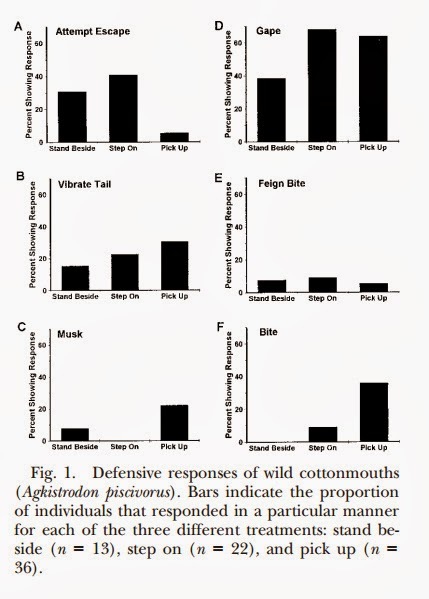 They found that flying squirrels, a major nest predator, ate the eggs out of 20% of nests without sheds, but didn't depredate any nests with sheds. Because flying squirrels are themselves vulnerable to predation by snakes, this makes intuitive sense. 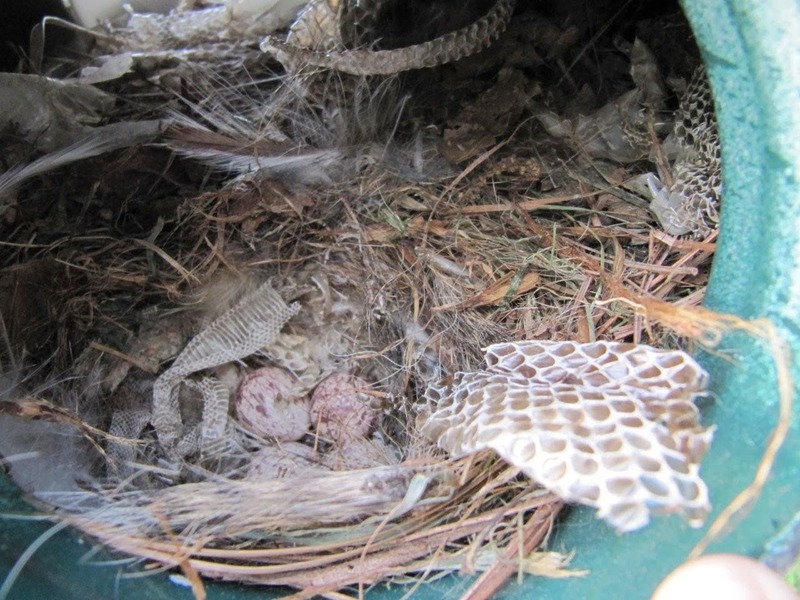 Interestingly, they also noticed that the deterioration rate of the snake skins in their experimental nest boxes (which were not occupied by birds) was much faster than that in real nests, where birds were actively raising chicks. Many of the sheds were eaten by ants, which would probably have been eaten by birds maintaining active nests. Ornithologists in Slovakia found opposing results - nests of great reed warblers festooned with snake sheds were no more or less likely to be depredated by birds and small mammals. However, over a third of reed warblers incorporated grass snake (Natrix natrix) sheds into their nests. When given a choice, two thirds of female reed warblers elected to use sheds left near their nests, whereas only 10% used ribbons of a similar length and color. If they weren't deterring predators, what were they for? The researchers suggested that because snake skins were mainly incorporated by female birds early in the nest-building process, they may have functioned as a signal to male reed warblers that the nest-builder was good at finding rare nest materials, which might lead the male to invest more heavily in helping share the duties of parental care later on in the nesting season. Humans use snake sheds too. 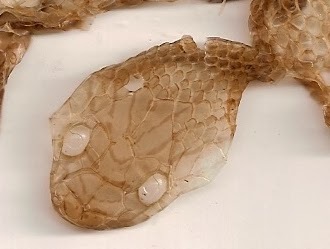 Because of their many similarities with the outermost layer of human skin, shed snake skins are used as model membranes in membrane permeability research, which primarily includes studies of ways to better transport pharmaceuticals into target cells, including some drugs that are inspired by or derived from snake venom (another ecosystem service). Snake sheds are a good alternative to using human, mouse, or synthetic skin, because they are cheap, large, and lack hair. This work is just one of many examples of snakes being used as model organisms to study general concepts in biology. Snake sheds can also be very aesthetically pleasing - many people have taken to creating beautiful snake shed jewelry. 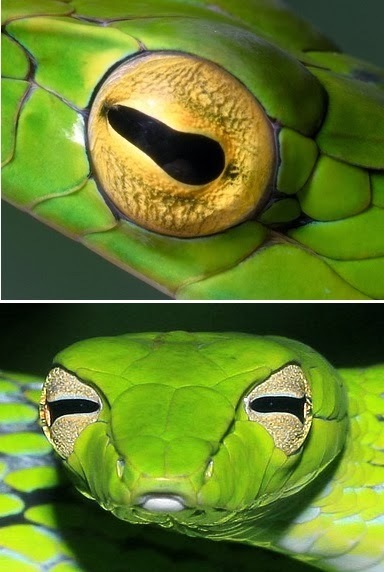 Finally, snakes are themselves very olfactory creatures. 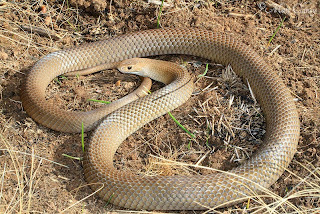 Skin lipid pheromones have been shown to play important roles in male combat and in mating behavior, which could mean that sexual selection could act on these chemicals, creating species-specific diversity and dimorphism between males and females, which is mostly lacking in other snakes (except for a few species, including Langaha from Madagascar, where snake play many important cultural and ecological roles). Because most of these pheromones are in the skin, what's the potential for snakes to use their shed skins to mark territories, communicate information about their reproductive stage, select ambush sites, or perform other functions? Really, no one knows. Although territoriality is not the norm in snakes, some species have been suggested to be territorial and others may exhibit other types of social behavior. I hope that by understanding more about the important roles snakes play in ecosystems, people attending this carnival will be more likely to see them as valuable and less likely to fear them. As I hope I've been able to communicate, the old axiom that 'the only good snake is a dead snake' is just not true. Stevenson, D. J., K. R. Ravenscroft, R. T. Zappalorti, M. D. Ravenscroft, S. W. Weigley, and C. L. Jenkins. 2010. Using a wildlife detector dog for locating Eastern Indigo Snakes (Drymarchon couperi). Herpetological Review 41:437-442. #SnakesAtYourService Blog Carnival - 9th December! 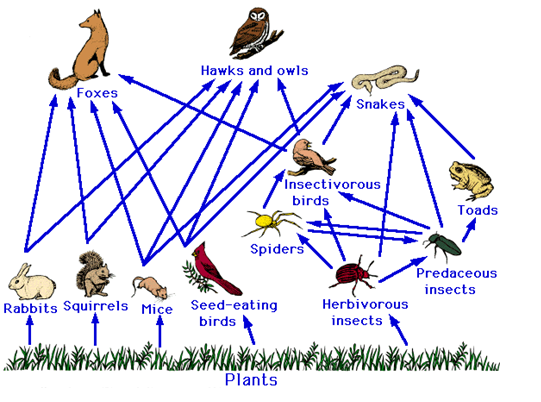 mostly eat insects and spiders. Next week, a few herpetology bloggers, including myself, are putting on a blogging carnival to celebrate the Year of the Snake! 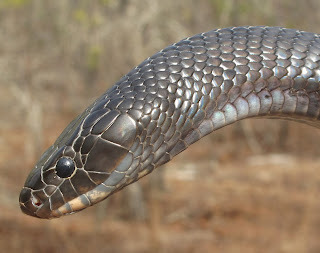 The theme is going to be ecosystem services of snakes - from the relatively well-studied relationships between snakes and their ecosystems in some parts of North America, to the basically unknown services rendered by snakes in Madagascar and elsewhere. Social media has become an important tool for conducting effective science education and outreach, and amphibians and reptiles, especially snakes, have much to gain from this kind of positive exposure. Many reptiles and amphibians occur in large numbers, are top predators, and provide important services to their ecosystems. However, these animals are often cryptic, and the general public seems to overlook their presence and great importance. As a result, we have decided to bring attention to a network of students, naturalists, and professionals that use social media to communicate information about amphibian and reptile natural history, science, and conservation. Our inaugural event is inspired by Partners in Amphibian and Reptile Conservation’s (PARC) Year of the Snake. On December 9th we will be publishing blog posts about the diversity of ecosystem services provided by snakes. 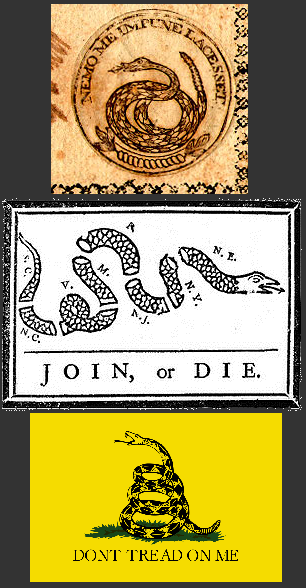 Snakes are generally vilified in the popular media. Our goal is to create new media that accurately portrays snakes’ importance in the hopes of decreasing the negative perception many people hold against them. Leading up to this day, we will be tweeting about snake ecosystem services using the hashtag #SnakesAtYourService. We encourage everyone to follow us on Twitter, visit our blogs on December 9th, and help spread the word about our outreach event, which we hope will be the first of many touching on different themes related to the importance of amphibians and reptiles. This week I am in northeast Florida collecting lizards for my PhD research (don't tell anybody who still thinks I only work on snakes). This is a special place for me because it is where I started writing this blog a year and a half ago. 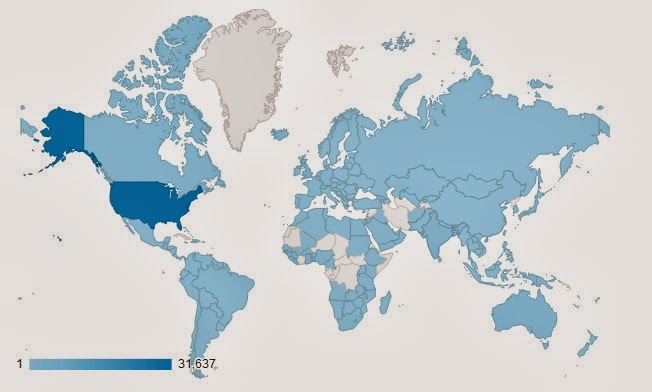 Since that time Life is Short but Snakes are Long has received thousands of visitors: almost 100,000 if you go by the stats included with Blogger, but probably closer to 48,000 using stats from the more conservative Google Analytics, which doesn't count bots and other non-human visitors. The true number is probably somewhere in the middle. With many thanks to Alvaro Pemartin and Estefania Carrillo, all posts are available in English and Spanish (the links to the Spanish versions are at the top of each post), and I am working on converting the format of the Spanish pages from PDF to HTML to more closely resemble the English pages. Readers from the USA make up the majority of visitors, but the UK, Canada, Australia, and India are also well-represented, and readers from 177 countries or territories have visited. I happened across your blog while searching for a way to identify a snake species by it's shedded skin. We found this [snake shed] in our barn near Lawrence Kansas. I had this extreme fear of snakes so I became proficient in identifying them, if I see them. 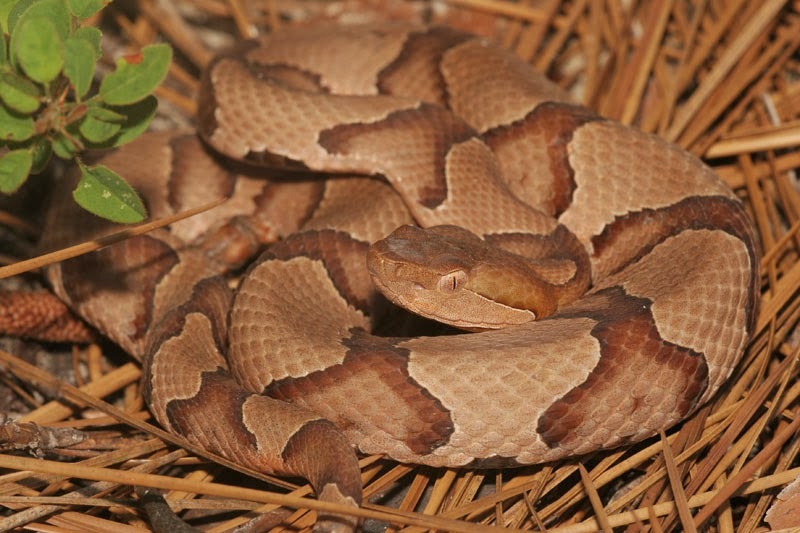 We have only seen 3 types of venomous snakes in our area, the timber rattler, the western massasauga, and the osage copperhead. Unfortunately, I find that I am truly inept at identifying them by their skins. We have seen more poisonous snakes this year than usual and we found this skin inside our barn. It very easily could have been trapped inside as we close it up every other evening. We primarily use the barn for storage and workshop. Hopefully, we have allowed plenty of opportunity for the snake to escape. I mainly want to know if you can help me to identify whether this is a poisonous snake. After reading your blog I am concerned is that it is possibly a copperhead and that it could be hiding. There are numerous places for a creature to stay hidden in our 70 ft barn and I fear that I will open a bin or cabinet and find it, dead or alive. We love our wildlife and try to be protective and careful, but it seems we have failed at this lately as we recently had to scare an endangered skink out of the barn. I would appreciate your assistance in possibly identifying this snake. I don't think we have the tail end of the skin. 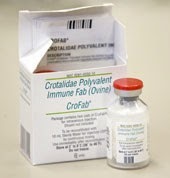 We do have the fairly intact head portion of the skin and can send more pics if needed. Your blog is very informative and I learned a great deal from it. I thank you in advance for your assistance. Thank you so much! I checked your blog to take a double look at your pics there and was still unsure, so thank you so much! 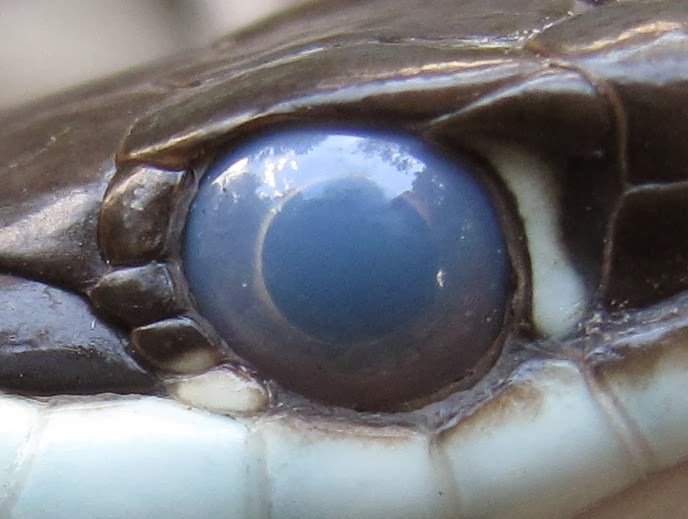 We did see a few rat snakes earlier this year so my guess is you are spot on! It is still scary that we didn't see it! We live in a rural area very near to public hunting and fishing but don't have a lot of traffic. It makes my blood boil at the number of snakes we see dead on the SIDES of the roads! Please keep up the great work! 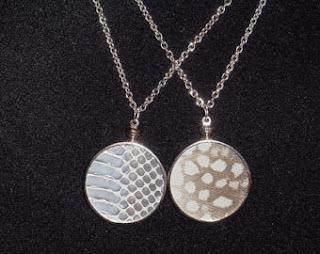 Yours was the first site when I googled snake skin id and by far the most informative i found! I learned so much by reading your blog and I really feel that people need more education about snakes! I'm open to suggestions about how to prioritize these and I'm especially open to ideas from readers about new posts that aren't on this list. Some of the best ones I've written so far are ones people have suggested to me. I'm also open to hosting guest posts if there are any interested guest authors out there. Feel free to leave a comment or to contact me by email. I also wanted to share a couple of stories from this week. Yesterday we found a young Cornsnake on one of our islands when one of us chased a lizard into the tree hollow where it was hiding. That snake had eaten one of the Brown Anoles in our study, a large male that we marked back in 2011. 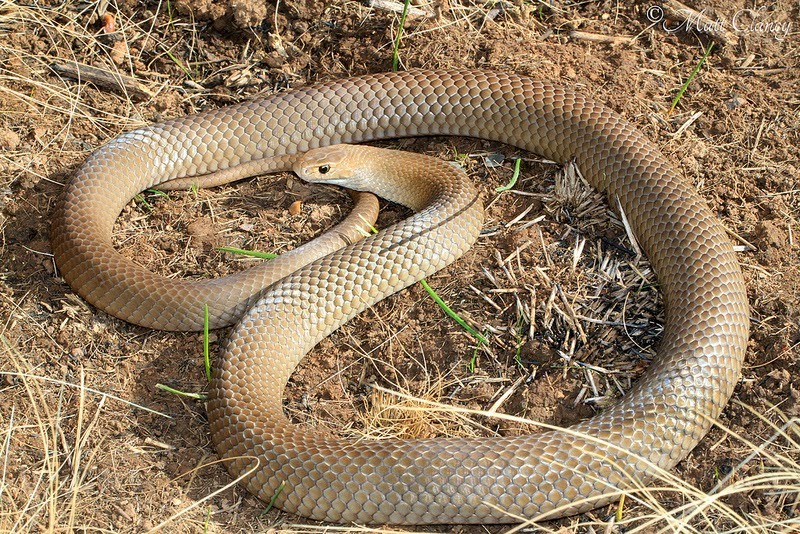 Young cornsnakes are particularly fond of lizards and ambush them from hiding spots under bark and within decaying trees. My former student David Delaney, now in the Warner lab at UAB, will be conducting research on the effects of cornsnake predation on anole sleeping site selection. I thought this would be the coolest find of the whole trip, but today some folks alerted us to the presence of an Eastern Diamondback Rattlesnake on a public beach right near where we were collecting mainland lizards for David & Dan's lab experiments. This snake was in the surf, which was really foamy due to the wind. The lady who found it said she almost stepped on it. Usually when someone tells you they saw a rattlesnake nearby it's either not a rattlesnake or not there or both, but this time it was for real! I have read about EDBs entering the ocean occasionally, but apparently it is fairly rare. 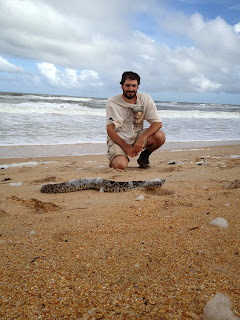 My friend Kerry Nelson, who worked as a naturalist on Little St. Simons Island in Georgia for almost two years and saw diamondbacks in the sand dunes daily, said to me that he never saw one in the surf. Thanks to Hans Hillewaert, Dan Warner, and Jean Ostrander for their photos and to Jean Ostrander for allowing me to reprint her email.